SMD Resistor – Surface Mount Chip Resistor Guide. A SMD resistor appears black from top with some blue colour. The colour at the bottom is white. Learn all about SMD Resistor. 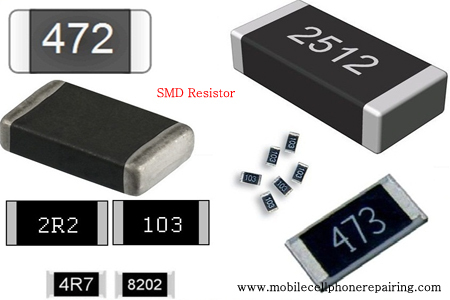 SMD Resistor or Surface Mount Chip Resistor is an electronic component with the properties of both obstruction as well as resistance. The property of this component is called resistance. The obstruction or resistance created by any matter in the flow of current is called resistance. What is the Graphical Symbol of Resistor? Which Alphabetic Character Denotes a Resistor? What Is The Function Of A Resistor? The Function of a resistor is to decrease current. What is the Unit of Resistance? What is the Power Rating of Resistor? The power rating of resistor is Watt. What does a SMD Resistor looks like? A SMD resistor appears black from top with some blue colour. The colour at the bottom is white. A resistor never gets short. Value of resistor can be high. Resistor is available with or without code. Mostly resistors without code are used in mobile phones. R and E alphabets in the resistor denote Ohms. Network Resistor: Combination of more than one resistor groups is called network resistor. They are made in a single package. Chip Jumper (Zero Ohm) Type Resistor: This type of chip resistor is used as jumper in mobile phones. Thermistor-Type Resistor: The rating of this type of resistor depends on temperature. It is black in colour from all sides. These resistors are of two types – NTC Thermistor (Negative Temperature Co-efficient type Thermistor) and PTC Thermistor (Positive Temperature (Co-efficient type Thermistor). LDR (Light Dependent Resistor): This resistance is dependent upon light. Resistance of a LDR may be several mega Ohms in dark, but is reduced to few Ohms under light. During manufacturing of resistors, some deficiency or excess may take place in its value. The tolerance of resistors used in mobile phones is almost zero. If the value of a resistor to be checked is 100 Ohm, then place probes of the Multimeter at both the soldering tips of the resistor and select knob of the Multimeter at 200 Ohm. Value of the resistor is displayed on the display screen of the Multimeter. If only 1 is displayed on the screen then it means that the resistor is OPEN and if the reading is too high then it means that the resistor is out of order or it is faulty. Resistors do not get shorted. Value of a resistor is considered OK within its tolerance limit. Brother I am a Bangladeshi and I do not have vast knowledge in English speaking. But I can understand your tutorial almost 90% and it is very helpful for me. Please be informed that I am a new technician of mobile servicing. I have started my initial stage of servicing from your website. I want to know How can I become a good technician. Is it possible from learning your website or I should take a course on it. Please suggest me. It is better to take a crash course and then work under an experienced for free few days and learn as much as you can. Once you are confident, start your own business. Very very useful for learners.Depth in the subject .thank you . an excellent tutorial for cellphone components and repair of cellphone. Thanks for the appreciation. I hope you find this helpful. thanks for good work, may the almight god bless you all.